A fillet knife can be one of the most overlooked knives in your set. Most people will just revert to using a chef knife for all their filleting needs, but in all reality, owning the best fillet knife will help you so much more than a chef knife. 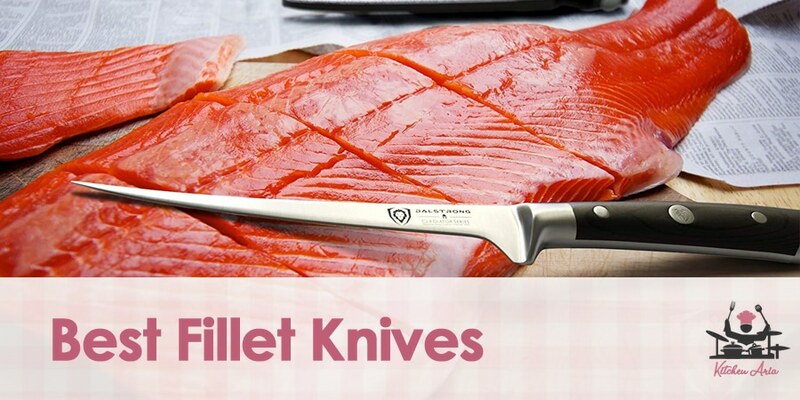 A fillet knife is specifically designed to give you the lightweight handling and control you desire when cleaning fish. The blade tends to be very flexible yet durable to ensure that the meat separates from the bone and skin easily. In this article, we will review several top-quality fillet knives to determine which is the best choice for you. We will also go over some things to look at when choosing a fillet knife so that you can make the right decision. Choosing the best fillet knife is just like choosing any other knife. You want a knife to exceed all expectations and most importantly, last a lifetime. Several different factors to consider are blade sharpness, blade retention, and overall construction. You will, of course, want to find the best quality of materials to create a quality knife. But you will also want some kind of warranty to guarantee the longevity of your fillet knife. The sharpness of the blade will play a major role in your ability to make precise and accurate cuts when filleting a fish. Having the absolute sharpest edge on your fillet knife is key. If your edge is not sharp then you may tear at the flesh of the meat, leaving the meat unseparated from the skin and bone, which you do not want. Blade retention is the ability of the knife to hold a sharp edge over time. Of course, you can use a sharpening stone or sharpening steel to sharpen your knife. But most knives are constructed of higher carbon metals, allowing them to remain extremely sharp over time without needing to sharpen them. The quality of the materials used to create the knife will determine if the blade will do what you want it to do. For a fillet knife, you want the blade to be thin, flexible and strong. Most Japanese knives are made with a higher carbon metal, making them thinner and sharper. Fillet knives are also constructed to bend without breaking, so a thinner metal will help to add flexibility. Other things to look for in a fillet knife would be the handle construction. You will want a knife with a full tang and at least 3 rivets within the handle. This will make the knife stronger. A handle that has an agronomical shape helps when handling the knife. You will want the knife to be lightweight but also have a good feel when held in your hand. The type of knife or what they call they blade will not matter as much. For instance, some may call their fillet knife a boning knife, when in all reality this is the same as a fillet knife. However, some may call their fillet knife a carving knife. This is not the same as a fillet knife. So, make sure what you are purchasing is indeed a fillet knife. Purchasing a quality knife can become quite expensive. So, make sure that when you are choosing the best fillet knife, the knife comes with some sort of warranty. Even though most fillet knives are durable and flexible, they are also the most prone to break or have some chipping over time. A warranty will help to protect your knife when it breaks. Most quality knife makers offer a lifetime warranty with their knives because they are confident it will last forever. If it doesn’t, they will either fix the knife for you or replace it completely. General care for your knife is not complicated. Always handle the knife with care as to not drop it. Store the knife in a wooden block or in a cool and dry area. When cleaning the knife, do not place it in the dishwasher or leave it to soak in water. This will damage the edge of the blade and in some cases the handle as well. To clean your knife, hand wash under warm water with soap. Dry the knife immediately with a towel, do not let the knife air dry. This fillet knife has been constructed of high carbon German steel which strengthens the knife and ensures durability over time. The knife has a full tang, three rivets and an ergonomically designed handle to aid in maneuverability and precision handling. The retention of the blade has been rated quite high on the Rockwell scale. This means the blade is sure to hold its sharp edge over time. It is an exact 7 inches long and also comes with a leather sheath to store the knife in when not in use. Dalstrong stands behind their product with a lifetime 100% guarantee on any chips, breaks or damages. While this knife may have some drawbacks when compared to other knives, it does have some positive points. The 8-inch, a non-tapered blade is constructed of high carbon Japanese steel which makes the blade extra strong. This will prevent the blade from breaking or chipping when in use. The handle has an agronomical shape with a textured finger point for minimal slip resistance. Although the knife is on the cheaper side and may not bring as much to the table as other fillet knives, Mercer stands behind their product by offering a lifetime warranty to protect the knife from wear and tear. Made from a low carbon stainless steel, this fillet knife is incredibly flexible, making it very easy to maneuver around skin, flesh and bone. The blade is made from one single piece of steel which adds extra durability and strengthens the integrity of the blade. The handle has been constructed with an agronomical shape and dimple featured design. This makes the knife easier to handle and adds a non-slip grip. The handle has also been hollowed out to create a very lightweight knife. This fillet knife comes from a very reputable company that has been making quality knife products for decades. Gerber is known for their outdoor gear and lifesaving instruments. The 7-inch blade is constructed of lightweight stainless steel with a convex edge. This gives the blade great edge retention and easy handling. The blade is made from a single piece of steel and has a full tang. The handle is made of a special material to allow the blade to be used in any weather condition without slipping. Lastly, the knife comes with a hard-molded sheath and ceramic blade sharpener. This makes the knife easily accessible and aides in sharpening the tool anywhere at any time. Shun is a well-known titan of the knife industry. They make excellent knives made from the best quality materials in the world. Many would argue they make the best fillet knife for saltwater fish. This curved 6-inch fillet knife is constructed of 33 layers of pressed low carbon stainless steel. Not only does the blade reflect a cool Damascus design but is also incredibly flexible. The patent D-shaped handle creates an excellent feel for the user for easy handling. The edge retention and sharpness of the blade are of the best quality and are upheld to the highest of expectations. This knife would be an excellent addition to any knife set. Victorinox is also a well-known cutlery producer of quality blades. However, this fillet knife may not be the best choice from their inventory. The blade is constructed of high carbon stainless steel to ensure durability and blade strength. While the blade may not have the best edge retention, it can be sharpened over and over again with a sharpening stone if the blade becomes dull. The handle is made to conform to your hand for easy handling and is also made of polypropylene which happens to be NSF approved. This chef knife is actually pretty nice for the price! Also made by another well-known knife maker, this would be a great choice to go with. The blade is made from a single piece of high carbon stainless steel. The type of material is their own special formula of stainless steel that differs from most other steel. The blade also has a full tang to ensure durability and 3 rivets to keep the traditional POM style handle in place. The rather large bolster is curved to bring an even balance to the knife for more accurate cuts. This fillet knife is one of the most basic boning knives available. Usually, these knives are used in professional kitchens and restaurants where there are multiple people using the same knife. The blade is made from stainless steel and can be very flexible when utilized. The handle is ergonomically designed to make handling and cutting easier. This knife is not the best fillet knife to buy due to its lack of several features. But for the price, it will do the trick in the meantime. This wonderful outdoors fillet knife is made for the everyday fisherman. You wouldn’t find this fillet knife in anyone’s kitchen, but more likely in their tackle box. The knife is made for fisherman to clean their catch rather than for the chef in the kitchen. The knife has a really cool outdoors appearance. The handle is made of polished wood and comes with a tooled leather sheath for storing when not in use. The blade is made from stainless steel and is coated in non-stick black PTFE which allows the blade to run through fish effortlessly. Wusthof is the oldest known knife manufacturer in the world. So, there is no doubt that this fillet knife is made with the best materials. The blade is made from a single piece of high carbon Solingen stainless steel which tapers off at the end for exact cuts. The patent synthetic handle is also held in place against the full tang with 3 rivets for extra durability. The knife also comes in a dyed leather sheath to store the blade when not in use. This knife is also one of the best knives to use for filleting fish of all kinds and in large quantities. This fillet knife is set apart from all others on the list simply because it is an electric knife. The purpose of an electric fillet knife is the ability to file a large amount of fish at one time almost effortlessly. The high-performance motor is able to run with twice the torque power of most other electric knives. This will allow the knife to go through bone like butter. The knife comes with its own protective hard case and is slightly water resistant to protect the working parts from any unwanted fluids. It’s hard to solo out one knife that will be the best of the rest. One knife may be the perfect knife for someone while it isn’t for someone else. At the end of the day, you will want to choose the best fillet knife to best suit your needs. There many different brands all with different types of construction and material makeup. Knives can become quite pricey, so make sure to get one you will not only be comfortable with but will also last forever. Any of these knives would be a great addition to your kitchen, so choose the best one for you from the list.